It's that time of year again....my favorite time of year. I love a new year for the vast newness of it, for its adventures yet realized, for its uncommitted hours and for all the promise it holds. I just love it. For the last two years, I have joined friends in claiming a word for the year rather than making a list of resolutions I won't keep. I gained Peace in 2011, Growth in 2012, and this year I am proclaiming my year of gratitude or Thanks. I heard a saying recently that was attributed to a number of different people from Ann Voskamp to Oprah that goes something like, "You can't complain and be grateful at the same time." So I intend to push out any complaining (that I don't really have a right to anyway given the blessings that God has showered me with) and fill that time with praise and thanks. I'm making a 2014 planner that will be all about thanksgiving, but I'll share more about that later. To help me remember and because I'm home for two weeks and feeling arty, I made a One Word Limb Chop for my word. I will keep it hanging all year where I can see it...probably in my studio. Then I'll hang it on my tree at Christmas time so I can reflect on my progress. I'm making some for some friends who have requested them, too. I've created a listing for my Etsy shop here for a custom order of your one word. BUT I'M ALSO GIVING ONE AWAY!!! 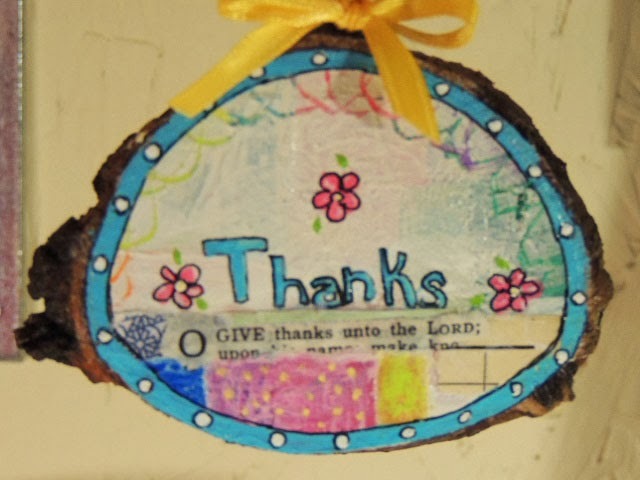 Just leave a comment here on the blog telling me your ONE WORD and why you have selected it and you will be entered to win an original hand painted LeissnerArt Limb Chop ornament of your very own. (Small Print: Only one comment per person please. The winner will be selected randomly sometime late in the afternoon on Sunday, January 5, 2014. The winner will be announced here on the blog, on my FB page, Twitter and on Instagram. If you don't follow me on those places, you might want to consider it so you don't miss anything. :) Your word has to be literally one word. Clauses or phrases will not fit on a limb chop. The color scheme will be similar to the item shown. Final design is also similar but my discretion (I probably will not seek out the perfect scripture to go with but will decorate with found papers). Thanks to you all for being here. May the good Lord bless your new year as only He can. Very nice Lori, I kinda feel like my word should be gratitude this year, with all the kindness others have shown me while I have been sick. BUT, this is the first time I've participated in this one word hop and I haven't felt my word yet. I keep asking for it to come, but not trying to force it. As I stand tapping my foot..
You know I love your limb chops - have not given the ones away yet, I purchased from you. I'm not at the point of being out and seeing folks yet. I want to worship with all my heart, soul, mind and strength. I don't think I am there and I do want so badly to get to that place! LOVE the thanks limb chop in the photo above. Love you, Lori! Long story. But "victory " is the word for 2014.
my word kind of chose me: KINDNESS. I choose Peace. 2013 has been very turbulent and I am hoping to have a different year ahead! Generous. I want to grow in generosity in every effort - finances, emotions, love, worship, discipline, service, fruits of the Spirit. Our God is the author of extravagant generosity. This is how God loves the world: He gave us his son. God shows no partiality in His giving to the righteous and the unrighteous. I want to develop the same attitude of giving, regardless of how others treat me or of their lifestyles, choices or beliefs. May God give me wisdom and guidance to grow in generosity so that I may be transformed into the character of His amazing Son! I found my word this week!!! CONFIDENT. I want to be more confident. Especially in the fact that He who began a good work in me will complete it. I had fun choosing "Wonderment" as my word and also wrote a poem on my blog that indicates what my "Path to Wonderment" needs to be. Joy...I want to remember to choose it every moment of every day. Beautiful post! I love your word. Last year my word was courage and boy did I need it. I am still trying to think of a good word, I got through the "courage" year and this year I am thankful and blessed. so maybe "blessed"
My word is Believe ... to remind myself to believe in my abilities and have the confidence to pursue my goals. Simple is my word this year. I want to bring my life back to the simple pleasures, simple answers and simple acts that may be just what they are and nothing more. I have found that the best in life are the simple non-convoluted things, acts, thoughts and gestures that mean the most. They happen in a hug from someone you love. A simple phrase like a "thank you", "I love you", "great job" or "I am sorry." Or in the unsaid gestures of someone helping you in the kitchen. Flowers cuttings from your garden and put in a mason jar for you to enjoy. The most SIMPLE non-monetary things are sometimes the best things in life. Sometimes the SIMPLE things you enjoy are not things. I have found in the first few days of 2014 that tough problems have some of the most SIMPLE solutions. So this year I pray you simple days filled with simple joys and success in all with simple efforts and most of all Love in the simple acts and gestures from those you love. Thanks so much for visiting my page. I can't always reply but please know I always read and I appreciate so much you reading and sharing my world. Hey! I'm Lori. This is where I share my life, my art, my poetry and anything else on my mind. Welcome! All art, photos, poems, and posts are the property of Lori Leissner. All rights reserved.